Man on Fire: D.C. police respond to reports of man who set himself on fire on the National Mall. Police investigate the scene after a man was on fire at the National Mall on October 4, 2013 in Washington, D.C.
UPDATE: The man who set himself on fire on the National Mall on Friday died of his injuries. And he was so badly burned that now authorities will have to rely on DNA samples and dental records to identify him, District of Columbia police said Saturday, according to the Associated Press. The man died at about 9 p.m. Friday, a few hours after he doused himself with gasoline near Seventh Street and Jefferson Drive at around 4:30 p.m., according to the Washington Post. The man was conscious and breathing when he was airlifted to the hospital. Police continue to investigate the motives behind his actions with one witness saying the man thanked the people who came to his aid. Original Post, Oct. 4 at 7:16 p.m.: A tense and surreal week in the nation’s capital neared its close Friday with reports of a man setting himself on fire on the National Mall. Details of exactly what happened remained scarce, although several eyewitnesses claim to have seen an unidentified man pour gasoline on himself before setting himself ablaze. [The man] was standing by himself at Seventh Street and Madison Drive, in the center portion of the Mall, when he emptied the contents of a red gas can on himself and set himself on fire moments later, said Katy Scheflen, who witnessed it as she walked through the Mall. She said passing joggers took off their shirts in an effort to help douse the flames, and the man was clearly alive as the flames spread. … She said he may have said something before he acted “but it was nothing intelligible.” She said she did not see him holding any signs. 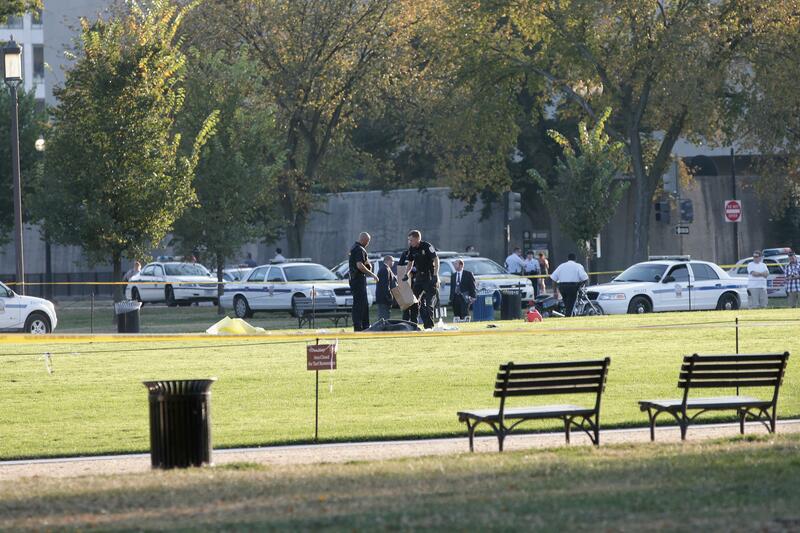 Nicole Didyk of the District was jogging on the mall when she witnessed the incident. … Didyk said she spoke to one of the men who tried to put out the flames afterward. That man told her that the injured man had faced the Capitol, doused himself on fire and then lit himself on fire. The man who tried to put out the flames said the victim told the people who had come to his rescue “thank you” afterward. Self-immolation is often associated with political protests, and the location (within sight of the Capitol) and the timing (during the shutdown) raise the possibility that was the case this time. Of course, the keyword there is possibility given the lack of any evidence directly linking the fire to a protest. “I’m not aware of any signage or any articulation of any causes,” Lt. Pamela Smith of the U.S. Park Police, which is investigating the incident along with the D.C. police department, told the AP Friday evening. And, of course, it was only yesterday that early reports of a shooting on Capitol Hill prompted similar speculation of a possible political motivation. One day later, however, and it appears increasingly as though the car chase that preceded the shooting was the result of a mentally disturbed woman who was unarmed and without a clear political purpose.